Anyway, Trinity kicks off with Marching With The Fools, a song which offers melodic speed metal passages, catchy vocal lines and neo-classical guitar leads. All that is a trademark for the Stratovarius sound. At Falling To Rise singer Gus Monsanto shows his range. This rocker is a melodic up-tempo tune and what fans expect from Mr. Tolkki. For A Lot Like Me they ease off a little, but it seems that this one was written for Timo Kotipelto, even if Gus Monsanto does very well. Actually I prefer him when he sings a bit deeper and not tries to hit the high notes. And that probably my main critic point, that some parts don't fit to his style / range. The slightly raspy voice of Mr. Monsanto can shine at The World Doesn't Get To Me, but it seems that Timo Tolkki don't want to take a risk and sticks to the formulary he developed years ago. But still it's one of my favorites as I think it's better suited for Monsanto. For Crossing The Rubicon they speed up again, and somehow this is a typical Tolkki tune, even if some parts also remind me a bit of old Helloween... The guitar solo is a bit too long in my opinion, but well... Perhaps they should have cut this one a bit as it's very repetitive. Just Let It Rain is another typical Tolkki song, at least for Dreamchild they slow down a little, the song features a prominent bass riff provided by ex-HammerFall Magnus Rosén and once more it's obvious that Monsanto is stronger at mid-paced tunes. The title track is about 10 minutes long and starts with acoustic guitar and spoken words, then becomes a rocker with tempi changes, symphonic elements and balladesque passages. Even if the song shows different facets of Revolution Renaissance, it lacks something. Trinity seems to be too calculated. The balladesque passages lack real emotion - and the refrain is too repetitive again. The closer is the ballad Frozen Winter Heart, a melancholy tune which shows that Mr. Monsanto can do expressive vocal parts. A good closer. 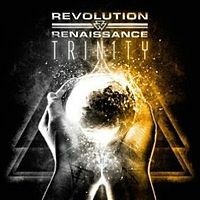 Revolution Renaissance are history, this was the final album. But perhaps Mr. Tolkki reactivates the band in a few years or start something new... Time will tell. Meanwhile fans of melodic speed metal should check out Trinity. A decent album, but can't match the most successful Stratovarius albums.